Christine Silawan, the CCTV footage, and the unidentified youth in police custody yesterday. Charges are set to be filed against the 17-year-old secret boyfriend of Christine Silawan for her grisly murder and horrible mutilation. 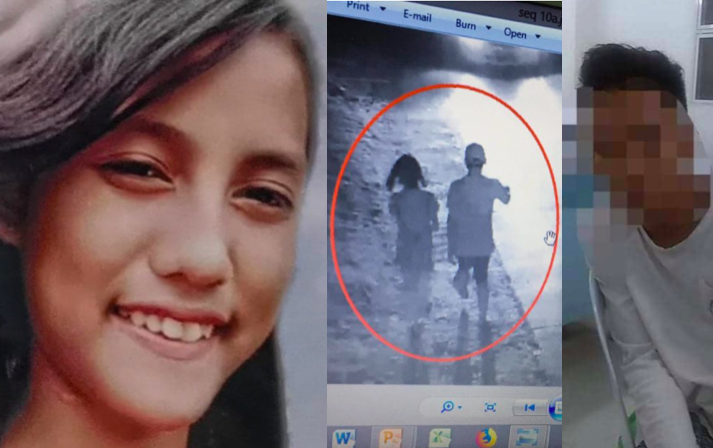 National Bureau of Investigation (NBI) Regional Director Tomas Enrile said that the teenager was spotted on CCTV footage with Christine before her killing. The youth has not yet been named. The NBI presented CCTV footage showing the suspect passing by the Sacred Heart Parish of Jesus Parish Church where Christine had attended evening mass. Other clips showed the suspect walking with the volunteer church collector. Mr Enrile said they had now applied for a search warrant to examine electronic devices belonging to the suspect. Screenshots of the chat conversations between the teenager and Christine have also been secured and will be submitted as evidence, the bureau said. The suspect was apprehended in an operation on Saturday (March 16). Speaking to the government-run Philippine News Agency, Christine’s mother, Lourdes, said she was convinced that the boyfriend was the killer of her daughter. She said she had no idea about the relationship as Christine had not told her about it. “As of now, I can’t still believe that he was alone in killing Christine. I didn’t know about the boy,” she said. Authorities are continuing to hunt two other suspects in the killing of the 16-year-old, whose body was horribly mutilated after she was stabbed to death. Part of her face was skinned to her skull and her tongue, trachea and oesophagus were removed. The grisly nature of the crime had led investigators to suspect a former Communist rebel turned cannibal cult leader for the murder. As we have reported, Jonas Bueno was arrested in Davao City last week for the murder of deaf-mute farmer in January. In this case, the 62-year-old had also had his face skinned to the bone. However, he is no longer considered a suspect in Christine’s murder. “He has no direct link to the slay of Christine Silawan,” Police Brigadier General Marcelo Morales said in a text message on Monday.